Built in Coos Bay, Oregon in 1976, this classic 38-foot Ingrid design sailboat sailed the Pacific Coast as far as Costa Rica before making a home in Puerto Vallarta. She is perfect for families or groups of up to 16 passengers looking to sail the seas of Banderas Bay without breaking the bank, and is available for customized private sunset sailing trips, day sailing adventures and whale watching trips. Make a day of it, sailing through Puerto Vallarta, explore and snorkel in the Los Arcos Marine Park or just bask in the sun with a drink in hand, feeling the wind in your hair and stopping every so often for a dip in the warm Caribbean waters of Puerto Vallarta. 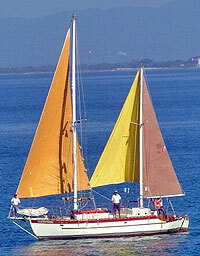 This sailboat is especially popular for sunset cruises.